A college professor once proselytized about an idea he called “Picassos Among the Avocados.” Fine art, he said, only reaches an elite few who seek it out when it’s hung inside of museums. Instead, he suggested, paintings and sculptures should be placed in supermarkets, so that more “common folk” might view the great works while loading up on bread and milk. Jazz and Colors inverts the prof’s concept somewhat. 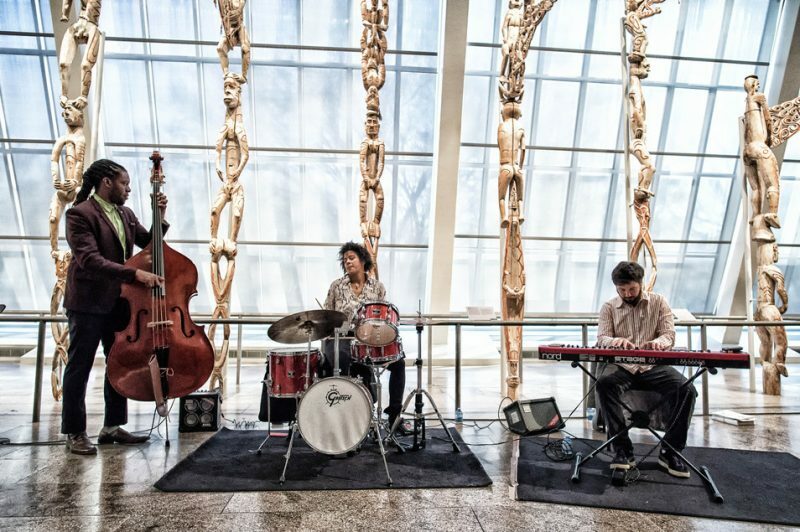 Only a minute fraction of the populace today attends jazz gigs, so why not bring the music to large, open, inviting-and colorful-spaces where more might be exposed to it? The first two Jazz and Colors events took place in New York’s Central Park during the fall months, 30 different bands and soloists scattered along the pathways with the foliage providing a multi-hued backdrop. Tourists and city-dwellers out for a stroll might stop and listen to a tune or two as they happened upon a band, then move on, or find a sound they liked and stick around for an entire set. 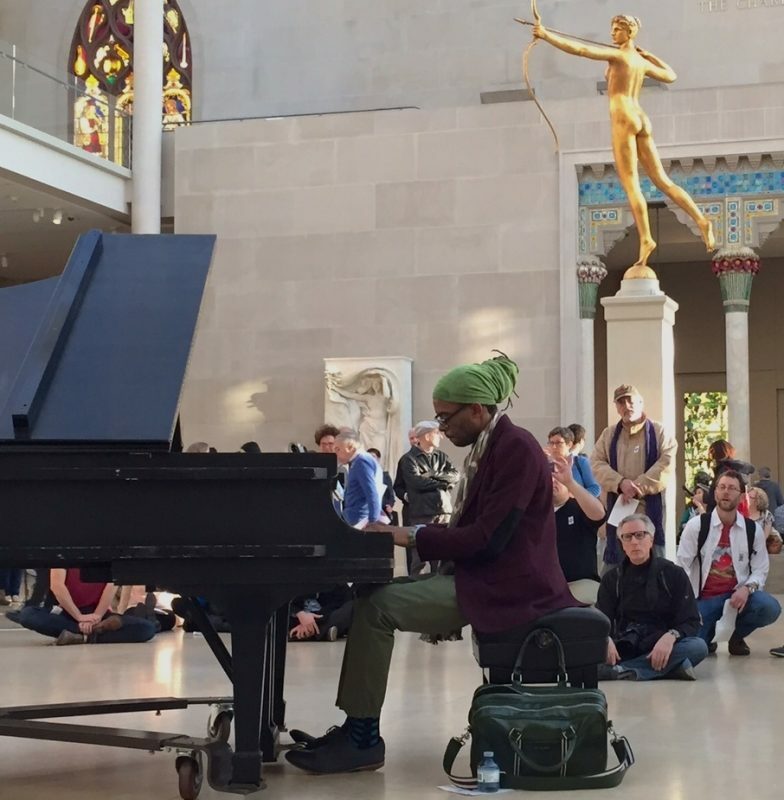 This January Jazz and Colors moved indoors to the Metropolitan Museum of Art, where the music was offered for free with museum admission. The number of artists performing was halved to 15, but the concept remained the same: each participant would perform an identical setlist, this time surrounded by classic artworks. 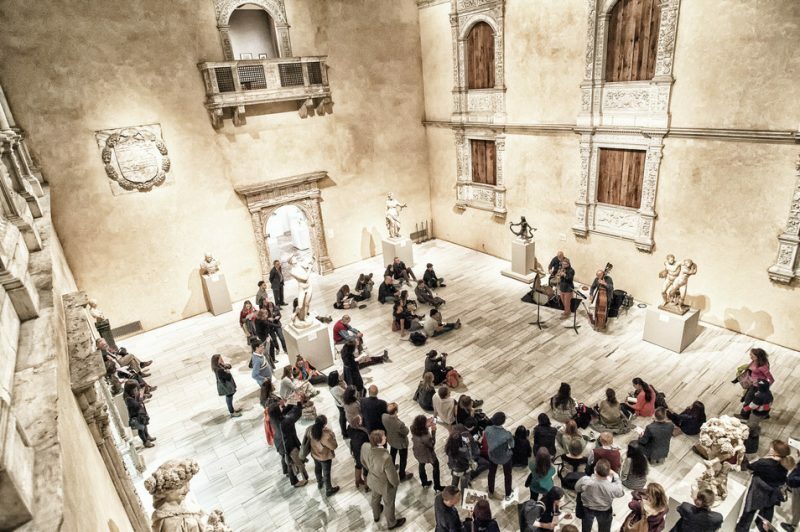 On April 24, the Met hosted its second Jazz and Colors-the “Full Spectrum Edition”-this time dropping the number of performers to 10, among them saxophone-led quartets, the full Jazz at Lincoln Center Youth Orchestra and soloists, including the mesmerizing guitarist Kaki King and pianist Marc Cary, who filled the cavernous Charles Engelhard Court sculpture hall with his grand piano musings. 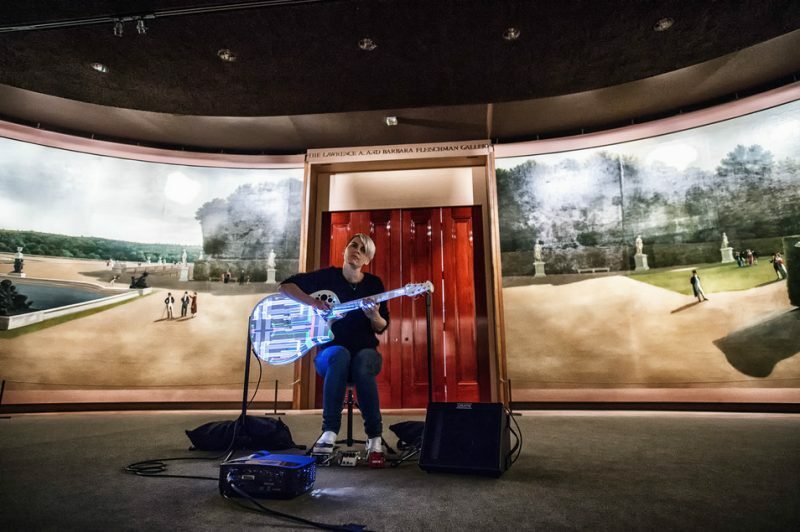 A museum-goer might catch his opening interpretation of “Sweet Georgia Brown” and decide to stay put for Cary’s entire two-hour set or hustle from one gallery to another within the maze-like, blocks-long building, just in time to catch someone else launching into Irving Berlin’s “Blue Skies,” one of the dozen standards each participant was supposed to (but didn’t always) play. McBride was just leaving Gallery 760 of the American Wing, where Marika Hughes and Friends had just wrapped their first set: Hughes on cello, Marvin Sewell playing guitar, Laoru Watanable on flutes and Keith Witty on bass. 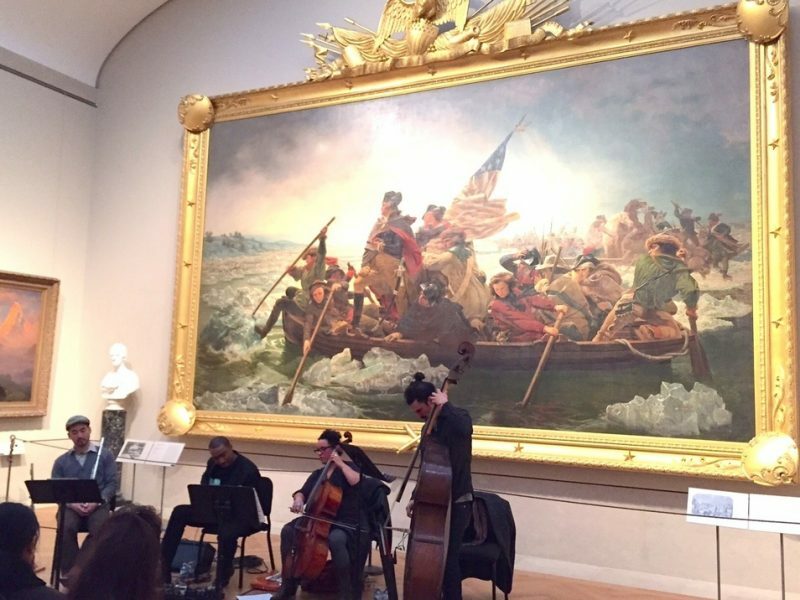 Afterward, Hughes remarked, “It’s amazing to play acoustically in this beautiful room and not need any amplification, and to imagine this music as chamber music,” although, she added, “it was a little weird” to be playing in front of a massive painting of George Washington crossing the Delaware. Theoretically, with a good pair of running shoes it might have been possible to partake of at least one song from each artist, but at some point it starts to seem like a better idea to simply settle in and focus, without trying to make sense of a map. 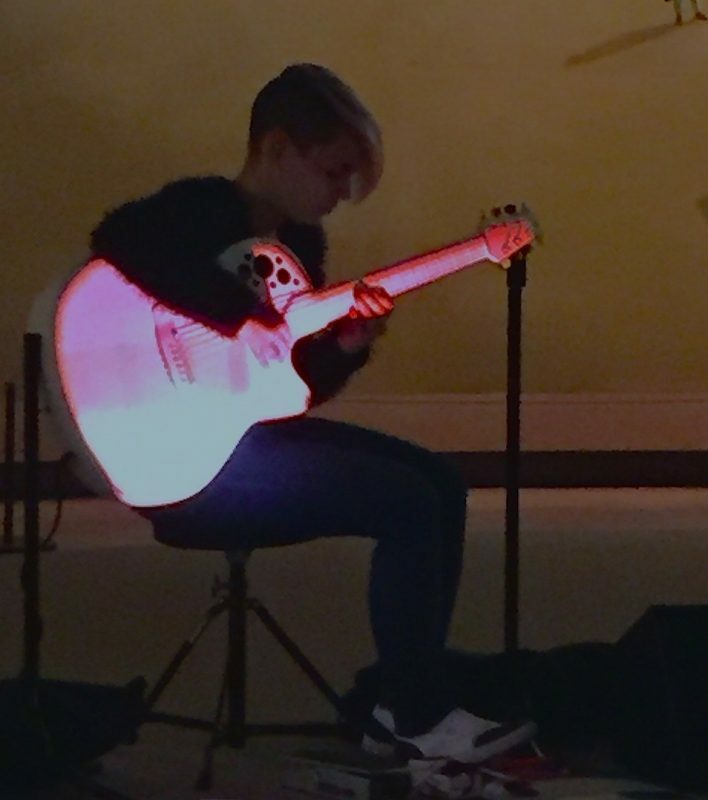 For this attendee, that moment happened early into the second set by Kirk Knuffke’s trio. 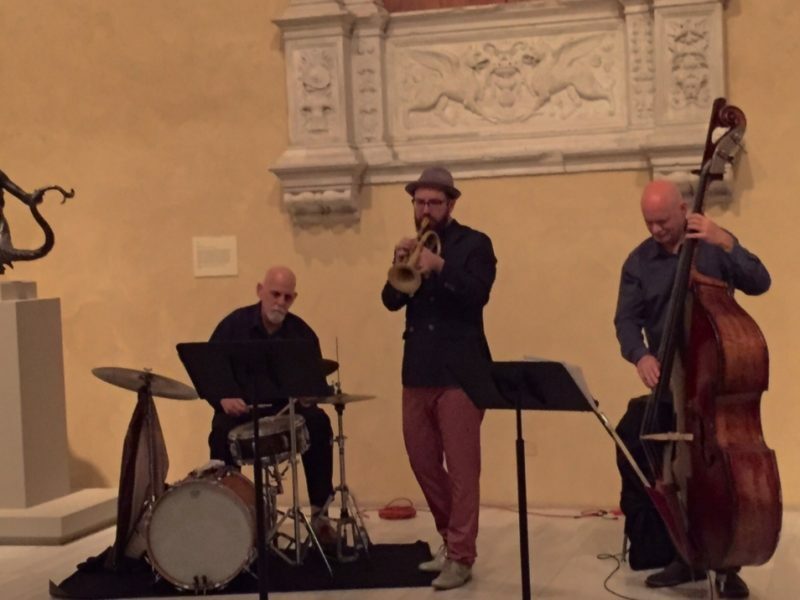 Performing in the Vélez Blanco Patio, cornetist Knuffke, bassist Mark Helias and drummer Bill Goodwin were just finishing a faithful take on Coltrane’s “Blue Train” when we entered the room. Knuffke next launched into a particularly soulful, mournful reading of Miles’ “Blue in Green,” Helias pulling long, resoundingly hefty notes out of his bass and Goodwin tenderly brushing, before switching to sticks and using the room’s natural echo to make the most of his cymbals. At that point, although equally glorious music was undoubtedly taking place just down the hall, there was no longer any need to move.